Hot, steaming, melt-in-your-mouth golden biscuits...with an added twist: fresh herbs! The perfect complement to a soup, stew, salad, or unique addition to any main course, these biscuits are like nothing I've ever tasted. The dough (made with a mixture of whole wheat and white flours) contains cream cheese, olive oil, and buttermilk, for a true savory and rich flavor. 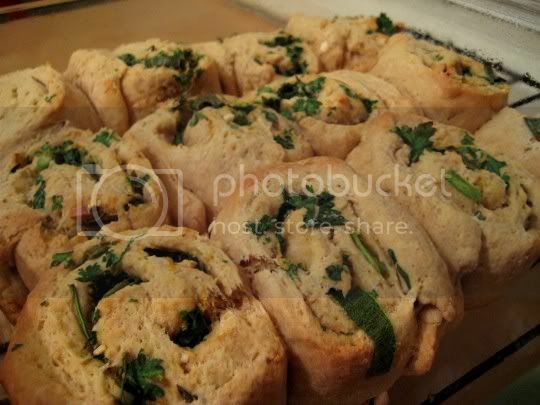 The herb mixture inside (fresh parsley, green onions, thyme, garlic, and lemon zest) adds a zestiness that can't even compare to a typical herb bread or muffin. The lemon flavor is interesting: I can see how some might find it odd, while others (like me) find it to be a surprising note. The tops are brushed with more olive oil before baking, but butter could be a good substitute. A couple recipe notes: decrease the salt in the dough by half, as there is already some in the herb mixture, so these were just a tad too salty in my opinion. Also, freshly ground black pepper might add some flavor depth, and you'd probably want to incorporate this into the herbs. Finally, when you roll this dough out, flour your rolling surface LIBERALLY. This dough is moist enough to stick, and you don't want things to get messy. Make again? Definitely. A good holiday choice for the bread dish. Try experimenting with other herbs as well: rosemary, sage, oregano, etc.